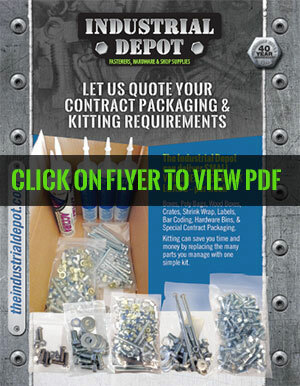 The Industrial Depot offers custom packaging, contract packaging, and kits. Components packaged as kits help to save you time and money. Provide us a detailed bill of materials and we can fill your requirements with securely packaged and clearly labeled products to meet your needs. Order one assembly and you eliminate the need for multiple purchase orders and are responsible for handling less components. This will allow you the opportunity to focus on your core business.